The scene is "a grove, with a view of the River Lethe," and Mrs Riot has already arrived in Elysium, the seventh visitor of the day after the Poet, the Old Man, a Fine Gentleman, Mr and Mrs Tatoo, and a Frenchman. She thinks Aesop very ugly and demands the pump-room, thinking Elysium a fashionable watering place: "Show me to the pump-room, then, fellow - where's the Company? I die in solitude." Aesop tries to philosophise with her, but she gives him a receipt for the vapours and sings a song "The card invites, in crowds we fly / To join the jovial rout full cry". 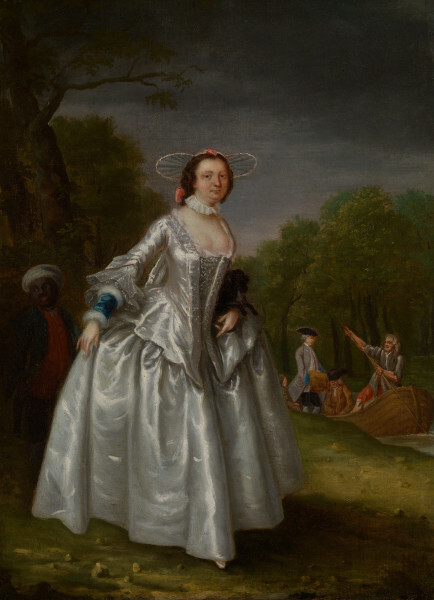 She wears a full silver panniered dress with a separate silver silk bodice. She has a blue muff trimmed with white fur on her right arm and a little black dog under her left arm. A little black boy on the left wears a red jacket and blue waistcoat. A man and a boatman are seen in the background on the left. This dramatic satire by Garrick, his first success as a playwright, was first produced at Drury Lane on 15 April 1740, with Henry Woodward as the Fine Gentleman and Mrs Clive as Mrs Riot. Mrs Clive chose “Lethe” for her final benefit at Drury Lane on 24 April 1769, when Thomas King played Lord Chalkstone for the first time, and James Dodd was the Fine Gentleman. This vivacious comedienne was one of England's celebrated personages in the middle years of the 18th century. An amusing actress and a good comic singer, Kitty was lavished praised by the critics and adoring members of society. In his “Dramatic Censor” (1770), Francis Gentleman believed Mrs Heidelberg in “The Clandestine Marriage” to have been "lost to the public when Mrs Clive retired." A phosphatic porcelain figure of her as the “Fine Lady” was made at Bow c.1750-55. A companion figure of Henry Woodward as the “Fine Gentleman” was fired at the same time.